The hottest new car about to hit the UK’s roads is officially the fastest production Mini ever built in the Mini John Cooper Works. Based on the Mini 3-door Hatch, it has a 2.0litre twin power turbo unit to deliver 231 HP and a useful 320 Nm of torque. The engine will propel the car from 0 to 62 mph in just over six seconds, with automatic transmission, the manual gearbox will do it in 6.3 seconds. The top speed in both versions is 153 mph. To help control the extra power, Mini engineers have revised its suspension and aerodynamics and added Piston Brembo front brakes (with 330mm brake discs). For those who like their sporty cars to have a throaty exhaust, the new Mini John Cooper Works comes with a sports exhaust that has a motorsport inspired sound. Owners of the new model will find the interior trim features sports bucket seats and there are some exclusive exterior styling additions too. Owners will also be able to enjoy economy of around 42mpg while having CO2 emissions of 155g/km. Opt for the model with automated sports transmission and economy will be boosted by 20% to nearly 50mpg. CO2 emissions are 133g/km. 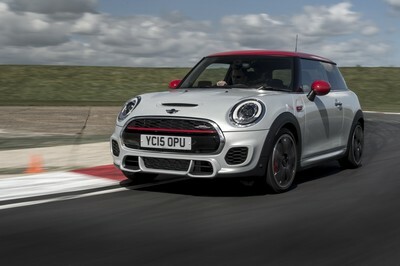 The engine used here was created for the latest Cooper S but the Mini engineers have developed a turbocharger and improved the direct fuel injection system. They’ve also added larger air inlets to the front apron to boost cooling requirements for the 2 litre unit. There’s no doubt that this is a true driver’s car with real sports performance and it’s a tribute to John Cooper who made his name driving Minis in competition. To help underpin its go-kart feel when driving, one of the reasons that make Minis popular, is this version comes with a bespoke sports suspension system along with 17 inch alloy wheels. With its low centre of gravity, the new Mini has stability and agility that most drivers will come to enjoy. With so much power on board, there’s also a dynamic stability control and torque steer compensation as well as an electronic differential lock control. Along with the performance control, the systems will improve agility when taking a bend at speed and the big brakes will help bring it to a stop quickly. There’s lots of safety and standard equipment and the option of a driving assistance package will see the addition of front mounted cameras to warn of potential collisions and traffic sign recognition, among other impressive uses. Available in 11 colours, the Mini John Cooper Works will cost from £23,050 for the six-speed manual and £24,380 for the six-speed Steptronic version. This entry was posted in Car Leasing, Cars, New Cars, Small Car and tagged lease a Mini, mini, Mini Cooper by Steve Lumley. Bookmark the permalink.